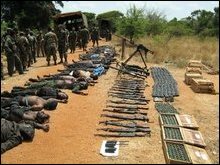 Sri Lanka Army (SLA) in Vavuniyaa handed over 25 dead bodies of Liberation Tigers of Tamileelam (LTTE) fighters, claiming that they were killed in action at Chriraddikku'lam, which is a GS area in Maanthai East division of Mullaiththeevu district. Meanwhile, Murungkan police handed over a dead body of a combatant to Mannaar hospital Friday evening. Arrangements to transfer the dead bodies would be undertaken after Vavuniyaa magistrate inspects the bodies, medical sources in Vavuniyaa said. The SLA said the Tiger fighters were killed in the fighting on Thursday. The LTTE is yet to release details of the battle. Chiraddikku'lam is located 22 km east of Vidaththaltheevu and 12.3 km northwest of Moon'ru Mu'rippu, which is situated along the border of three districts, Mannaar, Mullaiththeevu and Vavuniyaa.